There are 17 posts filed in Instructional ( this is page 2 of 2). It is recommended that you put new grips on your golf clubs at least every two years, if not annually. Also if you ever buy used clubs, you should install new grips. Most golf stores can do this for about $5 plus the cost of the grip. But if you are doing a full set of clubs it can get expensive. New grips – enough for all your clubs. If you are doing this for the first time you may need a couple of spares in case you mess up. 1. Remove the old grip with a sharp knife. Be careful not to score too deeply and damage the club shaft. Under the grip will be the old adhesive tape; remove this also. If it doesn’t simply peel off you can use a special tool for this. I just use a standard stanley knife and scrape it off. 2. 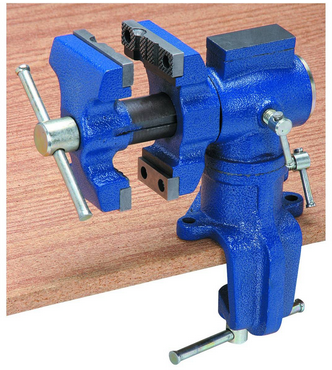 Place the club in a workbench vice. Use a rubber vice clamp so the shaft does not get damaged. You can get them for about $2 from most golf stores. It is really important that you use a vice to secure your club. Otherwise you will not be able to apply the pressure to put the grip on. I picked up a small portable table-top swivel vice from Harbor Freight for less than $25. 3. Apply the adhesive grip tape onto the shaft of the club. The tape can be found at most online/ retail golf stores. Measure the grip to ensure that the tape will not show once the grip is on. Allow about 1/2″ of the tape to stick over the end of the shaft. I then twist it together and stick into down into the top of the shaft. This ensures that no liquid can get in the inside of the shaft and cause any rust. 4. Spray mineral spirits in the inside of the grip. 3-5 sprays should be good. There is no need to by shy, the more you use the easier it is to apply the grip. Put your finger over the end of the grip and swirl it around. Then pour the mineral spirits out and onto the adhesive tape which is attached to the shaft. 5. With one hand hold the shaft of the club and with the other hand slide the grip on. Do it quickly and in one smooth motion – do not stop until the grip is fully on. If you have used enough mineral spirits the grip should slide on easily. If you do not use enough mineral spirits the grip will not slide on and most probably get stuck or rip. 6. Wipe off any excessive mineral spirits from the club using an old rag or a paper towel. 7. Remove the club from the vice and allow to dry for an hour or two before use. The mineral spirits will evaporate and allow the adhesive tape to stick to the grip. I use Winn Excel RF soft midsize grips in copper color (part # 6715W-CP). I love the feel of them – the grips feel really nice and soft in the hand. Also the color makes a change from generic black. I recommend that you go to your local golf store and try different grips to see what suits you. Also they will have samples where you can get fitted for size. Take your grip with the left hand only. Take notice of where the ring and middle finger end up. If these fingers end up wrapped into the palm (like making a fist) then the current grips are too small. If the fingers on the other hand almost form the letter “c” then the grips are more than likely too large. All of the parts required to do this can be purchased reasonably online through a website such as Hireko Golf. Chip shot (9 iron): The chip is best used when you are within 10-20 yards of the green or when on the apron of the green. Using a putting stroke the ball will fly low in the air and for a short period of time. The ball will land on the green and roll along it. This shot can only be played when you have a clear path to the green – i.e. there are no bunkers between the ball and green. Pitch shot (56-60 wedge): Used when you are about 20-50 yards from the green or in a green-side bunker. The ball is hit with a lofted club and will go high in the air. This is a much harder shot to execute than the chip shot. 1. 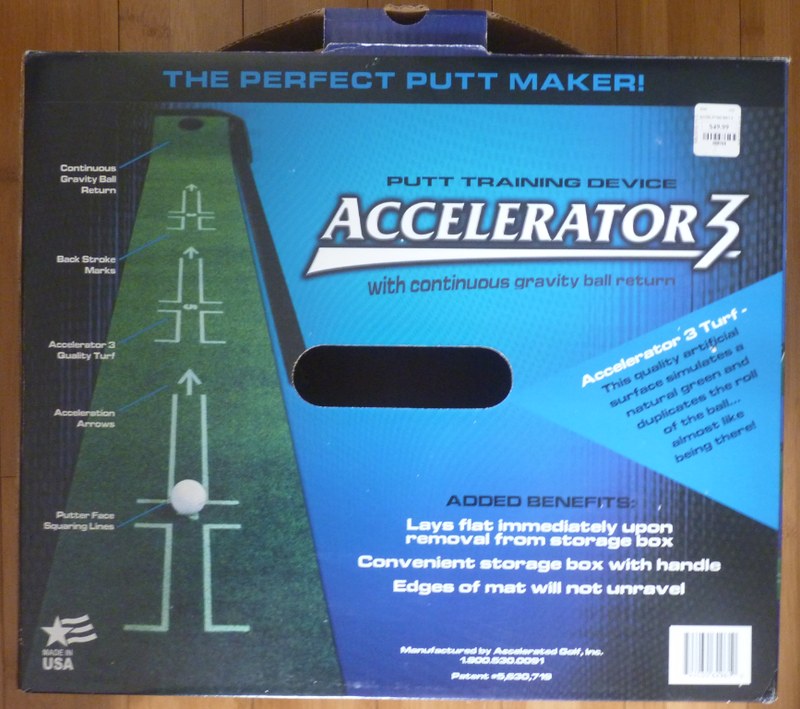 Putt whenever feasible (that means whenever the ball will roll rather than bounce). 2. Chip and run when you can’t putt. 3. Pitch only when you have no other choice. 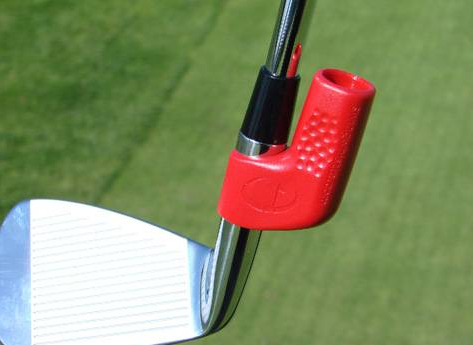 The majority of golfers (including professionals) use a putter for 40% of all shots in a typical round. Putting is something which really improves with practice. This is also the easiest aspect of the game to practice. Although it is always best to practice on a real golf green, there are a number of training aids which can be used to simulate the putting environment at home. 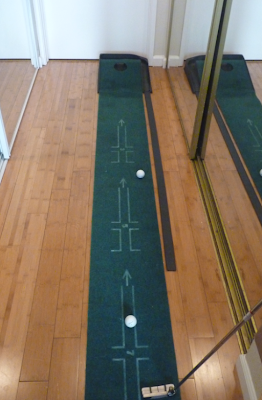 One of which is the SKLZ Accelerator (which I review here: SKLZ Accelerator Putting Mat Review). Here is a good short putting technique video which I found. It covers all of basics of putting in less than 3 minutes. Make sure your grip is perfect. Aim your club face at your target and sole the putter head directly behind the ball. Position your eyes over the ball and down the target line. Set your shoulders, hips, knees and feet all parallel to the target line. Your hands should be directly under your shoulders and you should have a slight bend in your elbows. Ball position will be 2 inches inside your left heel. Your forearms must be parallel to each other, maintaining the same place throughout the stroke. Keep your head still while maintaining the angle in your right wrist throughout the stroke. As with the grip, it is important to have the correct setup before hitting a golf ball. A whole website alone could be dedicated to this subject. But here are a few quick tips for the casual golfer. I strongly advise anyone who hasn’t already, see a professional for a lesson. Even if it is just one 30 minute lesson to look at your grip and setup, it will make a huge improvement to your game and help eliminate some of those bad habits early on. Alignment: At address your body (feet, knees, hips, forearms, shoulders and eyes) should be positioned parallel to the target line. Foot position: Your feet should be shoulder width for the middle irons. The short iron stance will be two inches narrower and the stance for long irons and woods should be two inches wider. Balance: Your weight should be balanced on the balls of the feet, not on the heels or toes. Posture: Your knees should be slightly flexed. 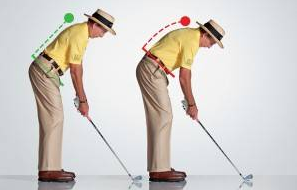 Your body should bend at the hips (not in the waist) with a straight back. The Swing Whistle is a small gadget which clips onto your golf club. 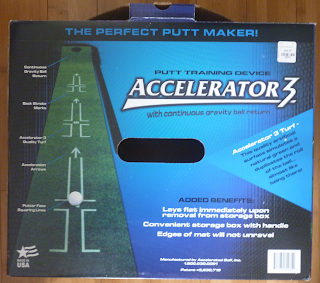 According to the manufacturer this training aid is designed to “provide instant multi-sensory feedback to train your swing to have maximum speed at impact”. If you swing with a good tempo you hear a constant low whistle at impact. Constant low whistle at impact = ultimate result. This means that you have gradual acceleration through impact of the club with the ball. The Swing Whistle retails at $19.95 plus shipping. I feel that this product is a little overpriced for what it is. 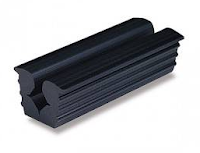 It is just a small piece of plastic – I would be more comfortable with purchasing it at a price point of around $14.95 shipped. Would I recommend it? Probably not. It is not that much of a game-changer for me. It makes the whistling noise as described. But I often found that with the speed of the swing it was sometimes hard to tell exactly when the whistle occurred. I would probably need to record the swing or have a spotter to give me feedback. What I do like about this training aid is that it can be used at home. You don’t necessarily have to hit a ball. Just swinging in the backyard will help you with your tempo. If you are hard of hearing or have issues hearing high pitch sounds, then this is obviously not for you! The grip is an important part of your swing mechanics. Without the proper balance in your hands your golf club can do a number of bad movements in your golf swing from beginning to the follow through. 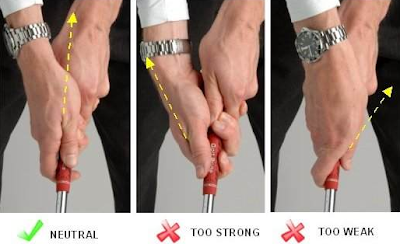 According to the PGA, 70% of golfers need to correct their grips. Here is a video from the Golf Fix. This is an instructional show broadcasted on the Golf Channel on Monday’s at 7pm. The Golf Fix is hosted by PGA 2012 Teacher of the Year, Michael Breed.